In 1980, the pendulum swung again for four of No Wave’s most influential musicians. Jody Harris, Donny Christensen and George Scott III were veterans of the Contortions and Pat Irwin had performed with George in 8-Eyed Spy with Lydia Lunch. They were done with moody lead singers and wanted to try another way. 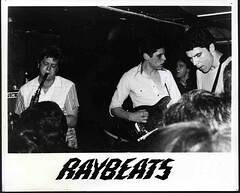 They formed The Raybeats. 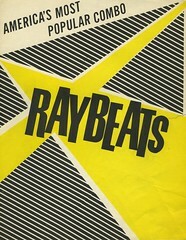 The Raybeats are often labeled a neo-surf band, but they were more complicated and interesting than that. Their sound wove twangy guitars with a downtown twitchiness and a moody sax that produced a rich cinematic feel – driving yet mysterious. Watch the clip, recorded in the summer of 1980 at Danceteria to get the feel of it. Tragically, a week or two after that gig, George Scott died of a drug overdose. “George was all heart,” recalls Irwin. “Don and Jody and I were waiting near CBGBs with a photographer to do a shoot, and he never came. After he died, we had a get-together at Donny’s. People came and we listened to Michael Jackson. None of us were capable of dealing with his death; it was heartbreaking.” Danny Amis joined the band as the new bassist and they recorded an album, “Guitar Beat,” and began touring. He left in 1982 and several others filled in until the group disbanded in 1984. Looking back, Irwin remembers it as a liberating time. “The Raybeats didn’t have any infrastructure. We would make a 45 and walk up to people and ask them to put it in their jukebox and they would. When I joined the B-52s, I couldn’t believe what it was like to have real management.” But looseness had its downside and things fell through the cracks. Miraculously, they just rediscovered recordings they made with Philip Glass. “They’re amazing, we hope to release them soon,” says Irwin. 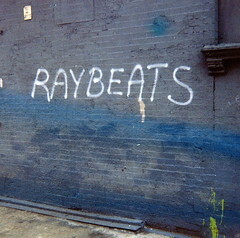 There was life after The Raybeats. Jody Harris continued to play with Robert Quine and the Golden Palominos before retiring from the music scene in the 90s. Don Christensen collaborated with Philip Glass, and began scoring animated films in the late 80s. He now devotes his energies to painting and running Orange Mountain Music, archiving Glass’s recordings. Pat Irwin played with the B-52s from 1989 to 2008, but also composed music for independent film and television, most recently for HBO’s “Bored To Death”. You may have recognized a suspiciously subversive twist to the music of Nickelodeon’s “Spongebob Squarepants” or “Rocko’s Modern Life”: Irwin scored them, too. His latest band, Command V with Cynthia Sley of Bush Tetras, released a new album this spring. Change is good.